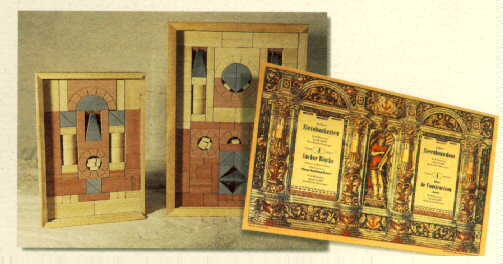 New Anchor® stone building sets and puzzles are being made again, and in Rudolstadt, by Rudolstädter Anker-Steinbaukasten-Fabrik GmbH & Co. KG, Breitscheidstr. 148, D-07407 Rudolstadt/Thüringen, Germany. Tel: 03672 / 31 11 0; Fax: 03672 / 31 11 29; e-mail. These wonderful sets are beginning to be imported into the USA once more. In February, 1997, these sets were reintroduced at the American International Toy Fair in New York. The CVA has published its Stone Catalog, which covers all of the stone shapes Richter made, plus shapes made by other innovators. Metal parts and most other accessories are included in the catalog. The contents of the sets are also listed. The cost of the catalog sheets (European size paper, intended for loose leaf use, but no binder) was f 48, plus postage costs, in Europe. A new revision is in process and will be completed soon, probably in late 2006. The updates concentrate on the contents of the unusual sets. The amount of detailed information is very great, and the information keeps coming in. All Anchor people need, and will want, a copy. I can e-mail a PDF file, but it is large (almost 100M), and to print it out correctly, you will need the European A4 size paper. For those who are really interested in Anchor stones, I have written a book about them. (I just got tired of either looking up the same information again and again, or trusting my memory on specific details such as dates and names.) It is expensive, $50 (or EUR 50) ppd, because I print it myself on my PC and color ink is expensive. The book undoubtedly contains far more information about Anchor stones and sets, the Richter company, etc. than you'll ever want to read. This book is a lot of work to print (I print about a dozen at a time; it is available in either English or German), so please don't think I am urging you to buy one. Remember you can buy it on CD-ROM for just $2.00, postpaid. Also on that CD you will find the CVA Stone Catalog.